I have the perfect recipe for pesto. It came, quite insistently, from my friend Don. We were friends for 29 years: two generations of journalists working for The Associated Press in Washington. After a chance collaboration when the Soviets shot down a civilian Korean airliner in 1983, Don pretty much adopted me as the newbie in the office. Boy, was I fortunate. I was a wide-eyed 26-year-old and he knew everything about Washington, having covered Congress, politics, investigations and eventually diplomacy. But forget about work – we became fast friends and bonded over lunches that lasted until last spring. Family, politics, hiking, theater, music, diplomacy, food, travel, more politics, you name it, we talked about it. Gardening was one mutual passion. And it didn’t matter how many basil plants I grew, Don had Better, Bigger, Newer. It became a running joke, was Napolitano basil better than Genovese? I’d throw in Thai basil just to get him rolling on a tantrum. 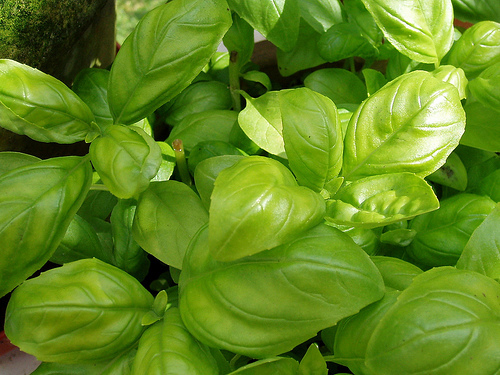 Or there was the year I advocated for baby basil, to his scorn. His passion was epic, no matter the topic. Add 2 Tablespoons of pine nuts, 2-3 Tablespoons of parmesan cheese, and enough olive oil to moisten. Pulse for 5-10 seconds at a time, and add enough olive oil to make a loose paste, then pulse to the consistency you like. You can freeze at this point and it will keep for many months. Our ongoing debate: Don added a Tablespoon of butter to his pesto; I insisted it was extraneous. For this season, Don, I will cede to you. Editor’s note: Donald M. Rothberg died last week after a brief illness. I can understand that the butter would make the pesto a bit more unctuous and add that bit of umamy to the taste of it. It’s all good. Thanks for sharing.